Look a little added bonus for you as I did make some other cards for show and tell on the day. 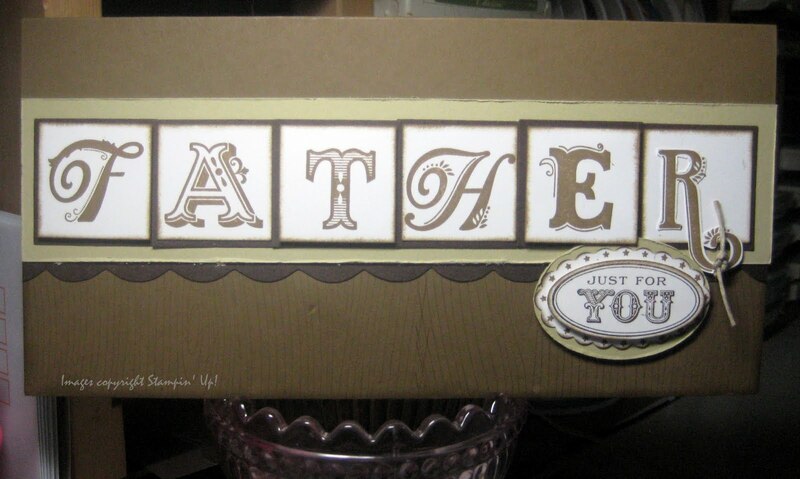 I love the simplicity of this card and it's really easy to make. 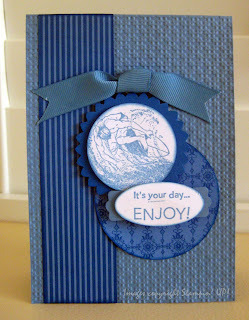 The greeting is from Occasional Greetings and a little sneak peek of the new Cherry Cobbler Seam Binding Ribbon. Card stock colours are Basic Grey, Basic Black, Whisper White and Cherry Cobbler. 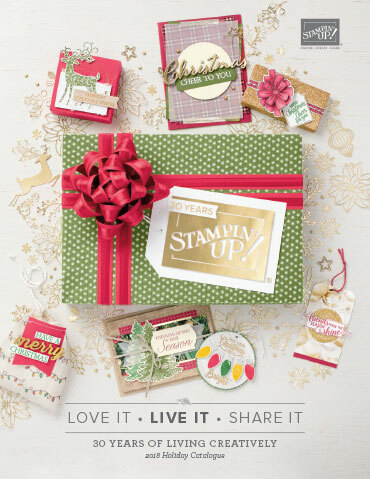 I have used the Square Lattice Embossing Folder and the Scallop Edge and Corner Rounder punches. 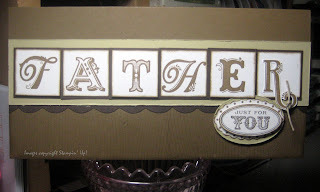 Once again on this card I have used the Square Lattice embossing folder. Card colour is Marina Mist and Whisper White. The DSP is from the Brights Paper Stacks and the stamp sets used were On Your Birthday and Seaworthy. I have used the Modern Label, Large Oval, 1.3/8" Circle and Scallop Punches and the ribbon is 5/8" Marina Mist Grosgrain. Okay here are the details. I have used cards and inks in Early Espresso, River Rock, Cajun Craze, Night of Navy and Very Vanilla. The stamp sets are Occasional Greetings (retired) and Extreme Elements. I also used the Hearts and Brackets Bigz Die (now retired) and the small and large star punches (also retired ... very sad really as I love my star punches .. mayve SU will bring out a Star Bigz Die here in Aus to replace them!) The ribbon on the card is Night of Navy 5/8" Grosgrain .. yep retired. You have to remember I did this class on the 29th August, so all of the above was still current. The stamp sets used were Broadsheet Alphabet, Woodgrain and Oval All. Colours are Soft Suede and Early Espresso in both card and inks .. oh and I also used some Whisper White and River Rock card as well. Punches used were 1.1/4" Square, Large, Scallop and Extra-Large Ovals. 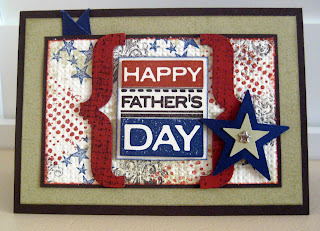 The little bit of scalloped card you see under FATHER is from the Tasteful Trim Bigz XL Die. Be back tomorrow with the second card. 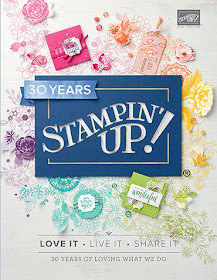 Good Morning Everyone and welcome to a brand new Stampin' Up! Idea Book and Catalogue. With a new year comes a brand new promotion as well and for those of you who were thinking that you might like to join up then this is the promotion for you. Join during the month of September and you will have two kit options to choose from! 1. 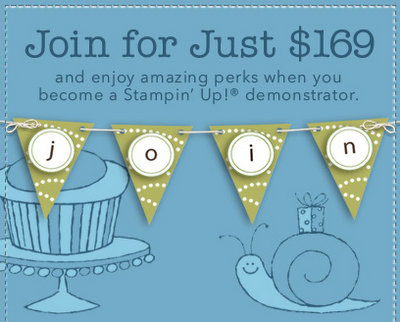 Join with the Mini Starter kit for just $169. It’s filled with products and business tools valued at $310! 2. Join with the NEW Starter Kit which is valued at $610 AND for the month of September you’ll get 20% off the normal kit price of $289 that works out to $231.20 .. amazing value! If you would like to join up now, then just head on over to my Demonstrator Business Website click on the JOIN THE FUN button at the bottom of my home page and join immediately, it's as simple as that. If you don't have your copy of the beautiful new catalogue, then email me here.